Rhode Island is home to high-quality lunch eateries serving up everything from juicy burgers to artisan wraps. Whether you’re looking for a quick meal on your lunch break or a relaxing midday bite with friends, you’ll find a great spot for it at these 10 lunch spots in Rhode Island. This restaurant, with a classy and calm environment, is the perfect place for a delicious lunch. Their space—slightly small—fills up fast every day! Regulars love the mushroom burger, tomato bisque, and rigatoni Bolognese. This sandwich place is ideal for a grab and go lunch in downtown Providence or Johnston. Their sandwich selection is seemingly endless—eat through their entire menu until you get to their daily soups, which are equally as tasty. With a new location on Broadway Street, Shoobies is improving upon a restaurant that was already near-perfect. With a fun and refreshing menu, Shoobies tasty eats make for a delicious and casual lunch! Stop inside Feast for a hand-crafted burger that uses locally sourced ingredients. Whether you’re chowing down on a juicy burger or a leaner artisan wrap, make sure to grab some house-seasoned curly fries on the side! This contemporary American restaurant is the perfect place for a meal or a night out for drinks, as well as a lunch out with coworkers. Go for a pizza, fired up in their 900-degree firewood oven, a crafted sandwich, wings, a creative salad option, or a delicious burger—and don’t skimp on the fried egg! Great for both brunch and lunch, Olga’s is a staple of the Jewelry District. You might also find their bread around several Rhode Island farmers’ markets, as far as Newport! Grab a spot outside under an umbrella or in their garden room-like interior to munch on a delicious sandwich or cup of soup. Iggy’s has been named as the “Best Clam Shack” by more than one news outlet, and they’ve more than earned their reputation. Try their chowder—known all across the state—some fried clams, or a scallop roll, and polish it all off with one of Iggy’s homemade sodas! This sandwich bar’s offerings vary with the season. 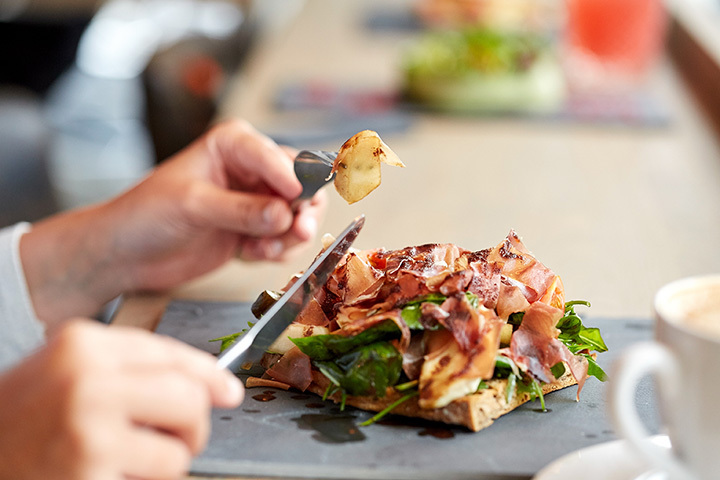 Make sure to go for one of their signature tartines, an open-faced sandwich on grilled bread, such as the smoked salmon or the Italiano, which combines honey cheese spread, fig preserves, and prosciutto. Vegetarians will also rejoice in the large variety of options that awaits them! Lunch starts at 11 a.m. at this unique restaurant. Tree House, family owned and operated, began as a florist and has since evolved to become a bar and restaurant. Try a unique dish like the lobster bread pudding or the veggie noodle bowl. You’ll find Sandwich Junction located off of the Post Road, near the airport, in Warwick. The shop carries over 24 different types of sandwiches and offers them at decent prices, too! Make sure to try the Freight Car, a delicious Italian Grinder-type sandwich.